More members to Amnes-Team 18/19! Our EGM on the 16th October elected more members to our committee this academic year. Campaign Coordinator: Holly Bird Welfare Officer: Adrian Scott Fresher’s Rep: Justin White Ordinary Members: Scott Beaton, Svenja Niederfranke, David Zuther Congratulations to our new committee members! It’s week 2! Congratulations on getting things done in week 1— now that we have you full attention, please welcome our committee elected in March for 2018-19! Presidents: Cara Brodie and Rachel Mellon Secretary: Lucy Branchflower Treasurer: Juliet Richards Fundraising Coordinators: Peta Stamper, Rachel Flynn, and Phoebe McGowan Social Secretaries: Laura Newton and Jordan McGuire … Continue reading Amnes-team 2018-19 welcomes you! Semester 2 has been a weird one. I am perfectly happy to blame industrial action and snow for my lack of upkeep on the blog. Luckily the snow didn't stop us from hosting the Scottish Student Conference this year in partnership with Aberdeen Uni! We wanted to share some of the events and resources here … Continue reading Scottish Student Conference! Amnesty International is an organisation of ordinary people standing up for humanity and human rights. 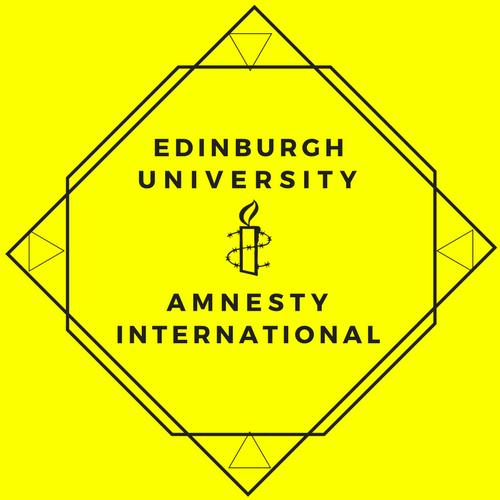 We're one of Amnesty's many student groups and meet every week to learn about human rights issues and to take action.